After an autumn in which Norwegian media have deplored a rash of deadly mass shootings in the US, commentators often neglect to mention that the deadliest ever occurred just outside Oslo. Now comes news that Norway’s home-grown ultra-right-wing terrorist reportedly has inspired at least three attacks against Muslims in France. Newspaper Aftenposten reported over the weekend that a group calling itself CDPPF (short for the “Defense Commando for the French People and Fatherland”) has already attacked and wounded five people at the University of Dijon, especially targeting women wearing head scarves. In a tape sent to the newspaper Bien Public, the group claims its attacks on multi-cultural symbols will be followed by more. The group claims it’s fighting against “Islamification of society” with openly racist and Islamophobic acts. The group has said it’s inspired by Anders Behring Breivik, Norway’s own ultra-right-wing mass murderer who gunned down 69 people at a Labour Party summer camp on July 22, 2011 after first bombing Norway’s government headquarters. Ravndal noted that there have been examples of individuals who have viewed Norway’s right-wing terrorist as a source of inspiration, both in Western Europe and Russia. “But often they also have other mentors, including mass murderers who have no political anchor,” Ravndal told Aftenposten. He also noted that there have been some signs of support for Breivik on the Internet, but that it’s something new if organized groups allow themselves to be prodded into action by Breivik’s acts and anti-immigration platform. Aftenposten reported that just a few weeks ago, French police warded off a right-wing extremist group’s terror attack in Southern France. Ten persons were arrested after they allegedly planned an attack against politicians at a mosque. Their leader was a man named Logan Alexandre Nisin, a former member of Action Francaise Provence, which has staged several “provocations” in Marseille and Aix-en-Provence. Nisin has reportedly never hidden his admiration for Breivik. Nisin’s mother was also among those arrested in what amounted to the first crackdown on a right-wing extremist group in France. International terror experts have long claimed they expect a major right-wing terrorist attack. Two politicians have received concrete threats in France, Nisin has administered a Facebook site that supports Breivik (now serving what may amount to a life term in Norwegian prison), and a young man arrested for having threatened French Presidemt Emmanuel Macron listed Breivik as a mentor. He also has been convicted for having promised to copy Breivik’s massacre on the island of Utøya six years ago. While bemoaning all the mass shootings in the US, some of which have also been right-wing inspired, Norwegian commentators still often ignore the country’s own mass murderer. Recent editorials in both newspapers Dagsavisen and Aftenposten decried the recent massacre in Las Vegas and liberal US gun laws without even mentioning Breivik and his own ability to acquire firearms in Norway despite much tougher laws. Two psychologists writing in Aftenposten, however, later acknowledged the parallels to Breivik, noting that not even Norway’s strict gun laws managed to prevent Breivik from killing a total of 77 people within a few hours. Breivik’s attacks in Norway are often dismissed as a fluke, and Norwegians have been prodded into acknowledging how a mass murderer like him could grow up among them, both by some politicians and the book One of us by author Åsne Seierstad. Now a film based on her book is under production, and unwelcome by some including the leader of the Labour Party youth group that Breivik attacked. 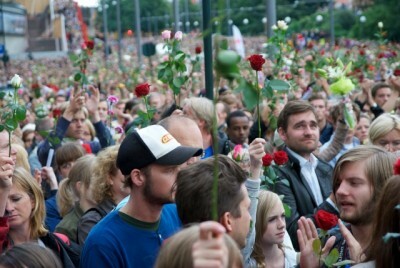 An apparent desire to discount or overlook Breivik is prevalent in Norway. Researcher Ravndal has himself claimed that Norway actually suffers little right-wing extremist violence compared to other European countries, when Breivik’s attacks are removed from the statistics. Newspaper Dagsavisen recently reported that he did just that in his new doctoral dissertation, choosing to measure attacks over time more than by the intensity of a single attack. “If I had chosen to measure intensity, Norway would have ranked as the most violent country in Western Europe when it comes to right-wing extremist violence,” Ravndal told Dagsavisen. He doesn’t think that’s true, and attributes the country’s open debate on immigration and the popularity of the right-wing Progress Party for making it more difficult for right-wing extremists to mobilize in Norway. Others disagree, with Sindre Bangstad of Norway’s institute for church- and religious research saying he’s not convinced that omitting Breivik’s attacks gives the right picture of the situation in Norway. Bangstad agrees that Breivik’s bombing and massacre were exceptional given the number of deaths, but leaving them out of the numbers downplays how affected Breivik was by anti-Islamic campaigns that are now being carried on by others.